Edit: all the spots are filled. Thanks for your contributions! Hello once again! Hope you had a lovely weekend. 🙂 Here we are with a new challenge. Yesterday I discovered a silly children’s book entitled Shark vs. Train. In the story, a toy shark and a toy train compete in various contests. Some of the competitions include trick-or-treating, playing video games and hot air ballooning. Have you heard of this book? 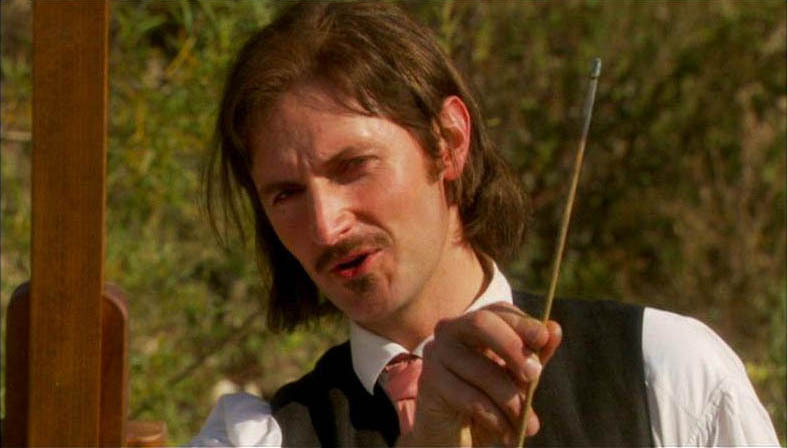 I decided to see what would happen if I pitted two Richard Armitage characters against each other. 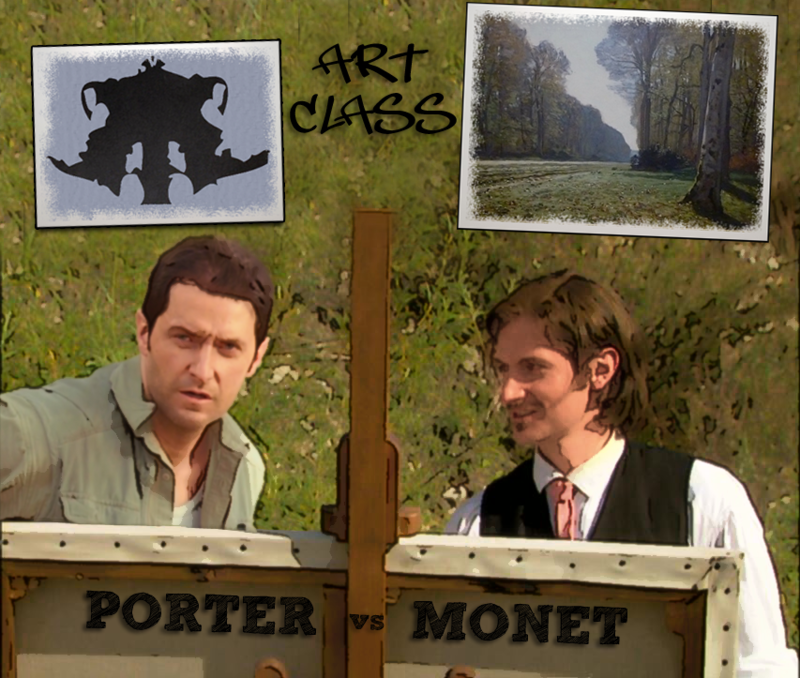 Below are some contests between John Porter and Claude Monet. You can click each image for full size. For our new challenge, I thought it would be fun for us to collaborate on some contests between various Richard Armitage characters. I hope you can play! If you would be so kind again, I would like for you to submit two different Richard Armitage characters and an event in which they can compete. If you are new, you are always warmly welcome to join in! Simply paste two image links to your choices of Richard Armitage characters and then add the name of your contest. You are welcome to make multiple contributions and I will create one graphic each. Our collaborative graphics will be posted daily, except Sundays, from tomorrow to June 30. The first 17 respondents will have a graphic made. Hope you can join in! Note: all 17 spots are filled! This entry was posted in Collaborative Project, Graphics, richard armitage and tagged actor, chris ryan, chris ryan's strike back, claude monet, graphics, john porter, richard armitage, robin hood, strike back, the impressionists. Bookmark the permalink. Here’s my proposition, Guy of Gisborne vs. John Thornton. @april73: Congratulations! You are #1 in the queue. I may not be posting in order. Thanks for your contributions! Brilliant idea and I love your graphics! I have read Shark vs Train– very funny! I believe it won an award- but I forget which one. I missed your last contest and I’d really love to see John Standring and Alec Track compete in something– how about first aid! Could someone help with the picture references? I’m on my ereader now and short of time. Anyone? Thanks! @phylly3: Apparently, the book won several awards. 😀 The first aid idea is a good one. You are #2 in the queue. If you can find the screencaps for me later, that would be most appreciated. Your place is safe in line. Thank you very much Lady Prisca! That is just what I was thinking about. I appreciate your help! Phylly , i think yours are better! Very good choice of pics. This is a super idea and the two examples you’ve provided made me laugh – they’re great. Will have to see if I can pick two photos and a theme when I get home from work tonight. Happy Monday, everyone! These graphics are very funny bccmee …. as well as being totally gorgeous!! Nice combination!! WOW! This is really a triple challenge: for the chaRActers, for us and, of course, for the Artist!! I wonder if we are good selecting the screencaps for the collage, but I want to try. You are #3 in the queue. Hi Bccmee. Very exiting new project. Thank you. @jeanniegisborne: Thanks for phoning in your contributions, LOL! 😉 You are #5 in the queue. And to make it interesting Bill Chatford from “Malice Aforethought.” Looks to me like he’s aforethougting something malicious right now. @jazzbaby1: LOL! Bill Chatford does looks malicious. Well- said! 😀 You are #6 in the queue. Ooh, this is such a fun idea bccmee! Here’s my suggestion. @jasrangoon: Thanks for your contribution! You are #7 in the queue. Brilliant Idea Bccmee! Here goes!! @antoniaromera: Yes, you are in plenty of time. Thanks for your screencaps and “chest breadth” event! 😀 You are #10 in the queue. @Elaine: So funny! What a gReAt idea! Thanks for your help again! 😀 you are #12 in the queue. @Gratiana: Thanks for both your contributions! It’s going to be a tough choice. 😀 You are #13 in the queue. Hope I can make it under the wire!!!! Hi Bcc, I loved this challenge! Hope I’m not late. Lovely to be sharing a Summertime Fun Challenge from the depths of wintry Canberra. Fun idea & I look forward to seeing all the “pairs”. I know I will like your creations anyway, if they are my picture choice or not ;o) Jippeee, some of your creations to look forward to in June! Thank you, bccmee!